We’re Ronni Taylor and Phil Hogg and we’re both HMRC content designers. We usually work in HMRC’s Manchester Digital Design Centre but for 2 weeks in August we moved down south to work alongside our GDS colleagues in London. It’s always great to put faces to names - and we really feel it’s helped to make the relationship between us much stronger. With the Self Assessment deadlines approaching towards the end of the year, we took the opportunity to review and improve the user journey for registering for Self Assessment. Users commonly tell us that they’re looking to ‘just do a tax return’ - for new users this starts with registering. But by HMRC sometimes giving too much information up front, the journeys become more complicated than they need to be. 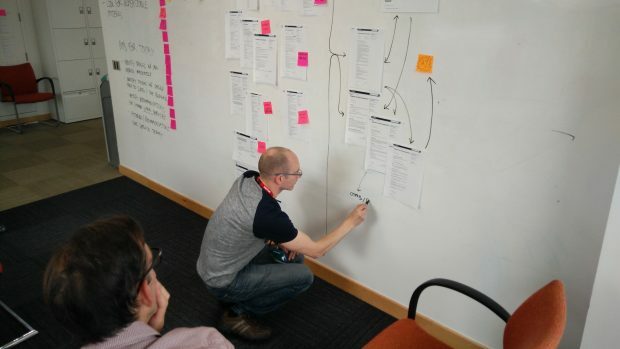 To really get a grasp of the issues, we worked with our GDS buddies to map out the existing GOV.UK journeys - and covered a number of walls in the process! By re-ordering and consolidating the information, we reduced the length of the user journey (in some cases from 5 steps to 2), making the whole experience simpler and quicker. One highlight of our time with GDS was designing the mainstream content - particularly during informal content crits and through GDS’s alpha content review process. We always want to work collaboratively at HMRC too, so it was great to pick up some best practices that we’ve brought back to try out in our office, such as the format of our retrospective meetings. We’ve come away more energised and very excited to see how the re-designed content will improve the user journey once it’s live. Spending time with GDS was a really worthwhile experience and we’d recommend all content designers to try it if you get the chance. Of course now we’re looking for an opportunity to return the favour to GDS! Ronni and Phil are both content designers at HMRC. If you'd like to come work with GDS to improve your content, contact us using the comments section below. Great post and another example of cross-government working! Thanks for getting in touch - I'll send you an email.